Enjoy a palatable dinner at Local Restaurant. Experience the feeling of real patriotism. 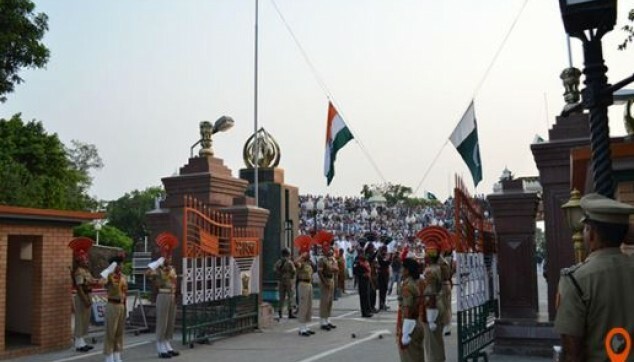 The Chauffeur with a guide picks you up from the hotel at 3 PM and proceeds towards the Wagah Border about 29 Km from Amritsar for Amritsar-Wagah Border tour package. On arrival, you would be taken to the VIP or foreigner gallery from where you can comfortably watch the entire Indo-Pak parade ceremony (Note - Access to VIP gallery is permissible for foreign nationals only). The flag down ceremony often starts before sunset time varies as per timing of sunset (around 4:30 pm in winters and 5:30 pm in summers). The Beating retreat ceremony at Wagah Border starts with the sound of cheerful patriotic songs and calling out ‘Bharat Mata ki Jai’, ‘Jai Hind’ and ‘Vande Matram’. Soldiers from both the sides start with an extremely fast parade, as soon as the heavy gates about 2 meters aside from both the sides are open by the infantryman, both the soldiers come closer, swap ferocious glimpse and aped threat. They handshake with each other and start lowering the flags at this point entire crowd will become silent and the only sound which we hear is the sound of the soldier’s boot. Then, the flags are neatly folded and carry back into the respective camps with dignity and pride. Finally, the Day Tour of Beating Retreat Ceremony at Wagah Border ceremony ends with a sound of trumpet followed by a final handshake of soldiers and closing of the gate. The complete ceremony is the power booster of patriotism and time to remember the sacrifice and courage of our soldiers. After the impressive glance of the ceremony, a driver will take you to the hotel or Restaurant you to mouth-watering dinner in Amritsar (fixed menu or buffet dinner). 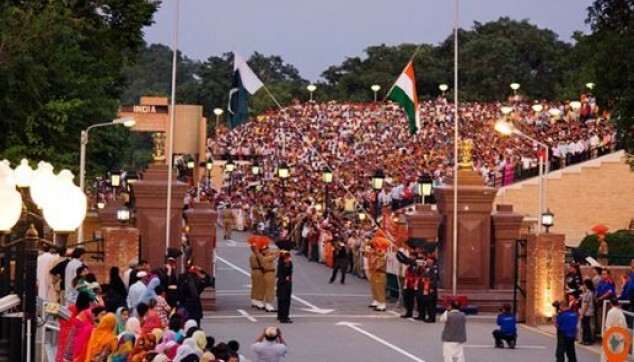 After dinner, we will drop you back to the hotel and with this, day Tour of Beating Retreat Ceremony at Wagah Border Amritsar tour package ends here. Thank you so much for the tours, it was brilliant. really worth to coming Amritsar, Shail is an awesome guide, very nice and friendly.. the driver (whose name i forgot) is a safe (unusual in India) and pleasant driver. i would highly recommend you to people. The experience at Wagah border was truly thrilling. I booked my tour with Indiator. Was very happy with the services. The cab reached on time and the driver was very friendly. Also, I liked the choice of restaurant. The food was very nice. Amritsar was always on the top of my wishlist because of its culture and the magnificent Golden Temple. I booked a tour with Indiator and they helped me to design a perfect holiday. The guide was very engaging and I got to learn a lot about the place. It was a very interesting and meaningful conversation that I had. Even our driver in Amritsar was very friendly and was always on time. On the journey, I learned about the general happenings of the city. After planning for days, Indiator helped me with itinerary and it was all very good. The stay at the hotel, the guide and the car was comfortable. I got to see Punjab. Thanks. I have explored Rajasthan and Delhi in India. Now, thought to move towards Punjab and explore its beauty. Amritsar was the first place that strikes my mind. I was always excited to see the Wagah Border ceremony. Booked this tour online. 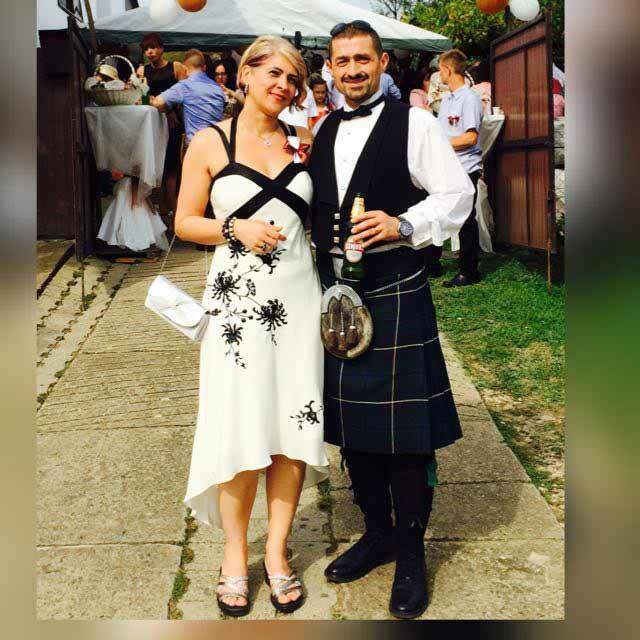 Was really happy with the services I received. The dinner was good, cab services were up to the mark and the assistance provided is highly appreciated.